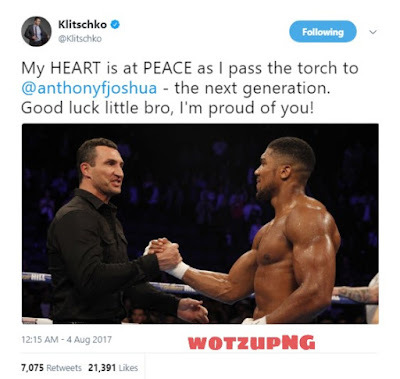 After announcing his retirement in what many sports fans see as shocking, Wladimir Klitschko took to twitter to state how his heart is at peace knowing he passed the torch to Anthony Joshua who defeated him in a heavyweight blockbuster back in April. My HEART is at PEACE as I pass the torch to @anthonyfjoshua – the next generation. Good luck little bro, I’m proud of you! 41-year-old Wladimir Klitschko has held the WBA, IBF, WBO and IBO heavyweight titles all under his 21-year career in boxing. He is also the longest serving heavyweight champion of all time behind Joe Louis.